Answer: Not a problem, we ship as fast as we are able to. Answer: Having multiple warehouses to pick from helps us get customer orders out quickly by reducing the travel time. Glad you were happy with the service. Fast shipping , and great product. Answer: Thanks, we appreciate your support. Found what I needed, delivery good and fast! The prices are competitive. Answer: You're welcom, thank you as well. Richard from RV Part Shop went the extra mile to find a source for my request for an accessibility lift as this is a new item for them and a special order. Item was supplied at a great price and delivery time was even better than promised. 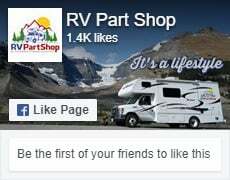 I definitely will be making future purchases at RV Part Shop. Thanks Richard for your help with this special order. Answer: You're welcome, hope the lift helps you continue to enjoy the RV and that we can serve you in the future. Site easy to navigate and great selection. Service is quick. Will definitely use in the future. Answer: Thank you, look forward to serving you again. Excellent service,very informative fast delivery,would highly recommend them to everybody that needs parts for their trailer. Answer: We appreciate any recommendations as a validation of our efforts. Thank you for your comments and referrals. Answer: We do our best to help, we feel it's what sets us apart. Thank you for your business. They were easy to order on line. Do your research for the product you need. Delivery was quick. No issues with my order. Very satisfied with this company. Answer: We appreciate your comments, thanks. Ordered online on Saturday, and product arrived on Thursday! Very quick turnaround time, thank you! Answer: Glad you were happy with the experience. You must be in a remote area, most of our deliveries are 1-2 business days only. Thank you for your comments. Answer: Thanks, we look forward to serving you again. Answer: We're happy you had a pleasant buying experience, thank you for your comments. Answer: We're happy to help, thank you for your business. Answer: We're glad you were happy with your experience.